We have an extended interview with ultra running legend, William Sichel. William, who is now 59 years old has been setting records and winning ultra long races for years. In our show he discusses how he got started, his life, his training and highlights some of his key moments. In Talk Training we discuss overtraining and highlight some of the warning signs. Speedgoat Karl joins us and we have a Meltzer Moment. We have a blog, discuss the news and mention the up and coming races and Christmas is less than two week away! I would guess that many of us entered the ultra world thinking, "I'll just sign up for 1 race." I know that I did when I first signed up for Mountain Masochist 50+ back in 2006. And I can very clearly remember the parking lot scene prior to a Signal Nob trail run--one of my first with my new-found group of crazy trail running friends--where Keith Knipling stated, "I'm not doing any more 100s--they're stupid." That was shortly after he and his dad, Gary, had completed the Grand Slam, and I just assumed that Keith was serious (he went on to run at least 5 more 100s over the next 8 or 9 months including 3 in back-to-back weekends, and both versions of TWOT, which only true nutcases ever finish). And I can remember thinking at the time (fall 2006) that 50 miles was enough. I'd do it once, and then return to my normal life. I had no desire to try 100 miles; 50 seemed like punishment enough. And I can distinctly remember finishing that first 50 and saying, "That was stupid. I will never do this again." Yet, somehow I ended up in Wyoming 6 months later at the start line of the Bighorn 100. My first 100 was a disaster--I tried unsuccessfully to drop for 50 miles, and still wish I would have dropped rather than have finished, but that's another story. But I'd definitely been bitten by both the ultra and 100 mile bugs. 100 miles is not my favorite distance (I prefer 50 miles, or my favorite distance, 100K), but somehow much of the past 6 years of my life has been consumed by training for and racing 100 milers. My non-running friends have described the Ultra scene as a cult. You get sucked in and never find your way back out. So what's the danger of getting sucked in? Obviously each individual is different, but getting sucked into the ultra cult has influenced my life in some significant ways. We speak to man of the moment Max King after his incredible wins at UROC and JFK50. Oz fast man, Brendan Davies talks about the ultra scene down under and his win at GNW100. Pocket Rocket Stevie Kremer tells us what it's like to move from the US to Italy and race at the highest level. Talk Training is about run shoes. 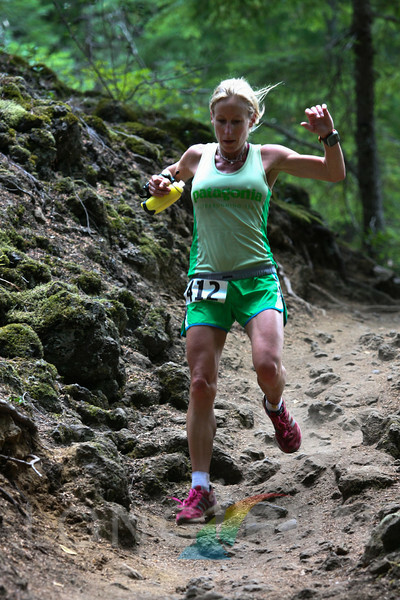 We have the news, a blog, up and coming races and of course Speedgoat Karl Meltzer. We interview The North Face athlete Mike Wolfe on his transition from Lawyer to athlete. Salomon athlete Linda Doke tells us all about Raid de la Reunion (Diagonale des Fous) and The North Face athlete Jez Bragg provides us with a coup at a TNF press conference held in London. We have a blog post by Frosty, the news, up and coming races and part 2 of Talk Training all about run technique. Of course, Speedgoat joins us for the a Meltzer Moment and as co-host. Our interview this week is with Salomon athlete, Andy Symonds. We have chat with Marathon des Sables RD Patrick Bauer and we catch up with ISF Executive Director, Lauri Van Houten at the end of the Skyrunning season. Talk Training has Pt1 of a 2 part discussion on run technique and Speedgoat gives us his Good, Bad & Ugly. We have a blog, the news and up and coming races.... oh, and don't mention my knees! No 34 come in... ! we speak to Speedgoat all about Grindstone 100. We have chat from the Royal Parks ultra with Dimitrios and Silvia from Salomon Running. Niandi Carmont catches up with inspirational ultra runner, Mavis Hutchison who paved the way for female running. Mike Le Roux tells us all about the Grand Slam of ultra. Ian Sharman discusses the news and Marc Laithwaite discusses 'winter' training in Talk Training. We have a blog for you and of course the up and coming races. A stacked show! Plus the Good, Bad and Ugly with Speedgoat Karl. We honour Teresa Farriol. Ian Sharman joins us for an update and a chat about the news. We talk to Terry Conway as he embarked on his first European race. Barry Murray discusses the Paleo diet in Talk Training and we bring you three interviews from Cavalls del Vent with Joe Grant, Anna Frost and Anton Krupicka. We have a somewhat different Meltzer Moment, up and coming races and a couple of blogs. Talk about name dropping... episode 18 has a stellar cast! Once again I have Speedgoat Karl with me for most of the show, we discuss his incredible run at Run Rabbit Run and we also catch up and talk about all his years in the sport. We speak to Mike Morton and get some feedback on his incredible Badwater win and we also talk about his record breaking 24 hour run. Prof Tim Nokaes is a legend within all sports, his book 'The Lore of Running' has been very much a bible for the keen runner, in Talk Training we discuss Tim's new book 'Waterlogged'. If that wasn't enough we finally catch up with the man who has got so many people into ultra, including me, Dean Karnazes. We also have the news, blogs and up and coming races. Phew... what a show!